Agroforestry systems (AFS) have the potential to foster long-term carbon sequestration and nutrient uptake. Yet, information on sequestration rates is still scarce, especially for AFS in temperate regions and for maturing AFS. This study aims to determine the rate and amount of carbon and nitrogen uptake in a 17-year-old northern red oak (Quercus rubra)–pecan (Carya illinoinensis) silvopastoral planting in Fayetteville, AR, USA. Seven oak and pecan trees were felled to develop AFS-specific allometric equations for above-ground biomass, carbon, and nitrogen. Tree-stand woody biomass (DWw), carbon (Cw) and nitrogen (Nw) and leaf biomass (DWL), carbon (CL), and nitrogen (NL) were calculated with these equations. Diameter at 1.37 m above ground (DBH) was measured annually, and a non-linear mixed-effect model was used to estimate absolute (AGR) and relative growth rates. DWw and Cw was 7.1 and 3.4 Mg ha−1 for pecan and 26.6 and 12.7 Mg ha−1 for oak, which corresponds to a carbon sequestration rate of 0.75 and 0.20 Mg C ha−1 yr−1, respectively. Total N uptake was approximately 66 and 71 g N tree−1 yr−1 for oak and pecan. The mixed-effect model with individual-tree-level random effects for all parameters provided the best representation of DBH growth of oak and pecan, likely due to the high heterogeneity of site characteristics. The AGR explained the non-linear plant growth and reached its maximum of 0.017 and 0.0179 m yr−1 for oak and pecan, respectively, 11 years after planting. This suggests that carbon and nitrogen uptake also declined after 11 years. The authors wish to thank C. E. T. Paine, University of Stirling, UK, who gave valuable insight to the application of mixed effect models in R. This research was supported in part by an appointment to the Agricultural Research Service (ARS) Research Participation Program administered by the Oak Ridge Institute for Science and Education (ORISE) through an interagency agreement between the US Department of Energy (DOE) and the US Department of Agriculture (USDA). ORISE is managed by ORAU under DOE contract number DE-AC05-06OR23100. All opinions expressed in this paper are the author’s and do not necessarily reflect the policies and views of USDA, ARS, DOE, or ORAU/ORISE. This work was partially funded through the Center for Agroforestry, University of Missouri under cooperative agreements with the USDA-ARS Dale Bumpers Small Farm Research Center, Booneville, AR. 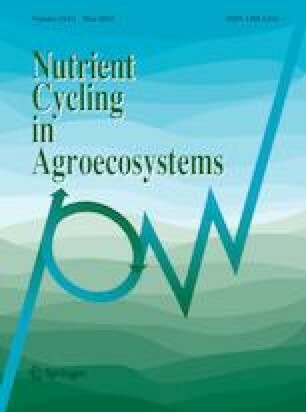 The authors also thank Dr. David Burner (USDA-ARS), the technical staff of USDA-ARS (Kevin Jensen, Kent Heikens, Gavin Simmons, and Forrest Goodman), as well as student assistants from the University of Missouri (Samuel Sergent and Matthew Cruise) for their help in the field and lab.